The programme covers a broad range of topics and the 3 ½ days of the conference includes: academics, physicians, psychiatrists, patients, service users, family members, carers, psychologists, social scientists, policy makers and journalists. This pluralism is welcome. Such “marketing opportunities” are not new. Before the 2014 congress, I wrote to the Royal College of Psychiatry expressing my concern about the combination of marketing and education. The College replied by stating that they did not share my concerns. This year, the Association of the British Pharmaceutical Industry (ABPI) are introducing a Register for payments to individual doctors from the Pharmaceutical Industry. We know that in 2012, £40 million was paid to doctors by the pharmaceutical industry. This may well include some of the doctors speaking this year. UK doctors have to demonstrate that they have acquired sufficient CPD/CME points for annual appraisal. Doctors also have to declare that they have followed the requirements of the GMC “Good Medical Practice” regarding probity, including any potential conflicts of interest. The 2015 ABPI database of payments to doctors will be open access. It is thus a welcome effort to increase transparency. Unfortunately however doctors can opt-out of being on the register. This means that we may not have any record if any of the doctors speaking at the congress have previously received any payments from the pharmaceutical industry. Last year, at another Royal College of Psychiatry conference, I was one of the speakers. Well in advance of the conference I suggested to the College organisers, and to fellow speakers, that we might declare any interests which we may have in the programme. As it turned out, I was the only one to do so. At this conference of last year, one of the speakers showed a slide of his extensive declarations of interest. I mention this speaker as I note that he is involved in several education events at the 2015 International Congress. If I have one hope in writing this blog it is that the Royal College of Psychiatrists might ensure that declarations of every individual involved in any educational aspect of this 2015 International Congress are recorded and kept on archive. I am of the view that such declarations should also be shared with the public. This could easily be done through a permanent link from the College website. 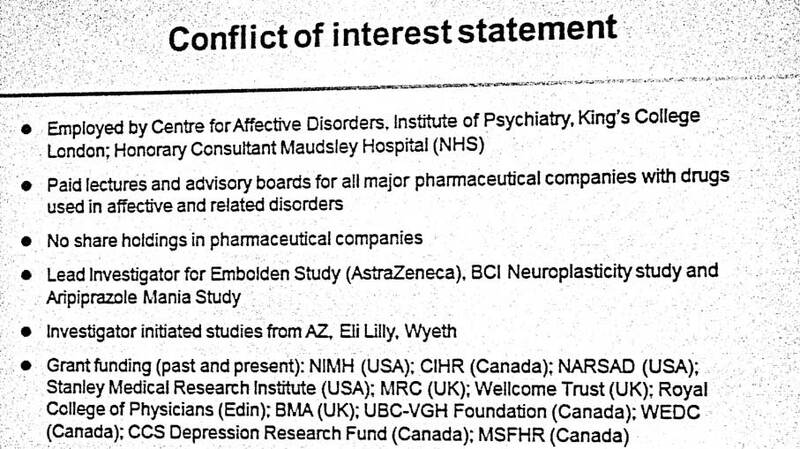 This database could also share the full payments from all industries that have taken up the “marketing opportunities” offered by the Royal College of Psychiatry. Reblogged this on The Pharma Chronicles.